Resurrectionists are a select group of people who cannot only remember their past lives, but also become them. Framed architect-turned-thief Jericho Way and his crew of modern-day tomb robbers aren't born knowing they've been trying to pull off the same heist for three millennia. First, they have to wake up. But with enlightenment comes grave danger-the eternally antagonistic Sojourn Corporation is now hot on their heels! 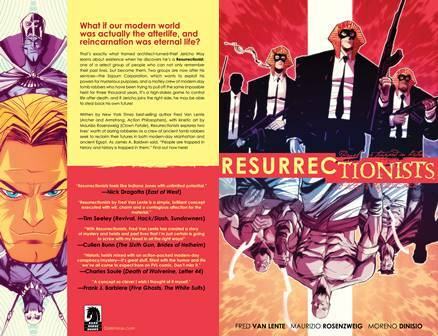 Collects Resurrectionists #1-#6.